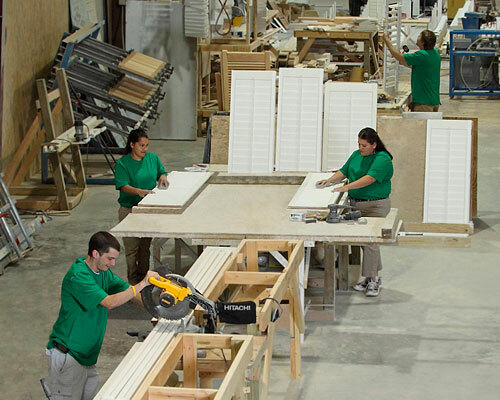 John Salley and Tripp Wilson started Summerville Shutter Company in 1996 with the goal of providing a quality, affordable plantation shutter to the Augusta, Aiken, and Columbia areas. We had the usual pitfalls of an under capitalized small business, but we have flourished because of our committment to customer service. We soon discovered that it was difficult to find a reliable source for wholesale shutters, so we decided to build them ourselves. In 1997 we became the only plantation shutter manufacturer in Augusta. This enabled us to control the entire process: maufacturing, finishing and installation. It also allowed us to provide our customers with a high quality, affordable shutter faster than the competition. In 2001, we built a new factory on Damascus Road in Augusta. We continued to grow and in 2007 we were making plans to add on to the buidling. Before the expansion happened, we had a terrible fire which burned the building to the ground. We turned this tragedy into a positive by rebuilding our new 10,000 sq. ft. factory on the same site. In August 2008, we moved into our new facility. Better and stronger than ever, we hope to out grow this building in a few years. We now provide full service shutter installations in Augusta, Aiken and Columbia.